Biplane Rides Over Philadelphia offers customers a ride of their lives. As an area that gleans its very name from the railroads, The Main Line was built one section of track at a time. While a ride along the R5 still take passengers through vibrant downtowns, the preferred way to view the highlights of the area is now often in a car. But for those with a taste for heights, the way to take in the entire Main Line, without waiting in train lines or at traffic lights, is from 1500 feet above. Biplane Rides Over Philadelphia makes it possible to take in the Main Line, Jersey shore and other area landmarks with the wind whipping through your hair, perched in the open cockpit of one of America’s most notable biplanes. The company is really a loosely assembled group of almost 20 people who decided to buy the Cannibal Queen, a 63-year old biplane used to train World War II pilots, and later memorialized by New York Times best selling novelist Stephen Coonts in a book that bore its name. The non-fiction book documents three months in the summer of 1991 when Coonts took the plane across America, landing in every state. The book is a “prerequisite to being a pilot,” according to Jim Lonergan, who pilots the rides over Philadelphia and its countryside. And for many of those enthusiasts, taking a flight in The Cannibal Queen™ is also becoming a must-do trip; he said many of his clients have read the book. Even many who have not, still retain an inner passion for flight that’s waiting to be unlocked. While The Cannibal Queen™ is capable of aerial acrobatics, the average rider is not a thrill seeker, Lonergan said. Unless there’s a special request, the average flight features gentle turns, with more of a focus on taking in the Philadelphia skyline, fall foliage, the Battleship New Jersey and other landmarks. The plane’s unique front cockpit seats two passengers. Many clients come for the first time because they received a gift certificate. Lonergan admitted he wasn’t sure what to expect in terms of a client base when he bought the plane three years ago. While Lonergan and his partners were familiar with The Cannibal Queen™, he first encountered the plane in person four years ago, when a pilot friend arranged for Jim and the previous owner to have lunch. The plane wasn’t even for sale at that point, but by Christmas of that year, it was at its home hangar at Northeast Philadelphia Airport. 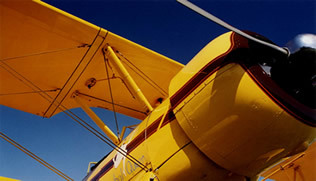 After serving as a plane for the Royal Canadian Air Force and U.S. Army, the plane served as an agricultural spray plane for 30 years, and was restored in 1987, four years before Coonts’ journey. Now, the plane guides tours that range from a 20-minute jaunt along the Delaware River, to hour-plus long flights around the city and along the Main Line. The group’s Web site is www.biplaneridesoverphiladelphia.com. It shows rates and different trips, as well as directions to the different airports The Cannibal Queen™ flies from. Rides can also be scheduled at 800-247-2371.